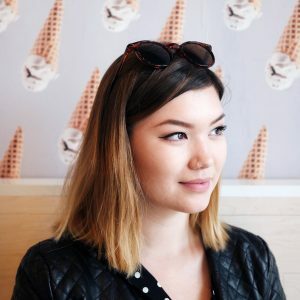 I am a 4th year undergraduate student at Simon Fraser University, exploring my love for various forms of media through my Communication and SIAT studies. I’ve always had an interest in the production of video, especially short narrative films. Through my SIAT course with Kate (IAT 344), however, I discovered an interest in the production of more documentary-style pieces. Working with CityStudio and the City of Vancouver, my team and I produced a short documentary, “MOVE“, about multimodal transportation in Vancouver. It was on display at the Museum of Vancouver from January to May 2016, as part of the museum’s “Your Future Home” exhibition. This spring, I received an FCAT Undergraduate Research Fellowship award and was lucky enough to work with Kate and her team at the Making Culture Lab. Alongside Kate and Rachel, I worked as a curatorial assistant on “Hidden In Plain Sight”; an exhibition highlighting documentaries produced by UBC Journalism students in collaboration with VICE News. I designed various graphics for the event (including booklets, promotional material, and cardboard VR viewers) and created a recap video of the event (see below). I was excited to employ video and graphic design — two of my main interests of study— to assist in the curation of the event. Hidden in Plain Sight: VR Documentary Screening Event, Vancouver. from Kate Hennessy on Vimeo.